PERTH, Australia - Prime Minister Stephen Harper offered some rare praise on the economic front to the European Union while prodding the United States and China by name Thursday at a Commonwealth business forum. Harper, less than fresh off a 30-hour flight from Ottawa, expressed "cautious optimism" at the tentative, debt-crisis package hammered out by European leaders during an intense, 11-hour bargaining session in Brussels. "What we have been waiting for is something big enough in scale and decisive enough in terms of sacrifice that markets will be convinced the problem is being tackled and the pain is being accepted," the prime minister said in a speech to the well-heeled luncheon crowd. "Only then will fears subside and confidence be restored." European leaders agreed early Thursday to boost a bailout fund to a trillion euros, about C$1.4 trillion, while private creditors will be asked to accept 50 cents on the dollar on the insolvent Greek bonds that helped spark the current crisis. Europe's biggest banks will also be required to increase their reserves by $148 billion by next June to help them weather the Greek losses. Greek leaders vowed to bring the country's debts down to 120 per cent of gross domestic product by 2020. Under current conditions, it would have ballooned to 180 per cent. Harper called the moves "steps in the right direction. Progress has genuinely been made." But he added caveats, noting details must still be fleshed out and the program "successfully implemented." Harper prefaced his comments by calling the European debt crisis "the most immediate and imminent threat to the global recovery." 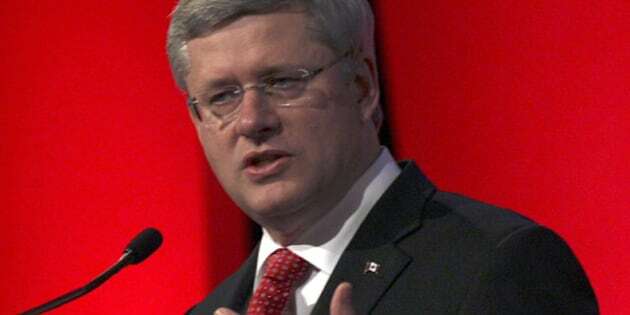 He's been an outspoken critic of Europe's collective failure to act decisively to stem the economic hemorrhaging the past two years, a point Harper reiterated Thursday while simultaneously attempting to salve Europe's bruised common market. "I know we are all frustrated with the situation that's been taking place there and the time it's taken to resolve," said Harper, who nonetheless called the European Union a "remarkable achievement." This weekend's Commonwealth summit in Australia immediately precedes a crisis-atmosphere G20 leaders meeting scheduled for next week in France. The deal worked out in Brussels raises the prospect of a less rancorous G20, but Harper used his speech in Perth to maintain pressure on other economic leviathans who will be at the table in Cannes. The prime minister reiterated his now well-worn list of needed economic measures, including debt reduction, trade liberalization, global financial sector reform and "global imbalances." Harper bluntly stated it will "not be indefinitely sustainable for an economy as large as China to run surpluses with inflexible exchange rates." And as for debt reduction, he said, "for others, including the United States, credible mid-term strategies still remain necessary." For a Canadian prime minister to be upbraiding the world's two largest economies at in international forum speaks to Harper's current economic self-assurance. "My intention is to be activist and not alarmist," he told the Commonwealth summit business crowd. The prime minister's Canadian bravado received the support of Tom Jenkins, the CEO of OpenText Corp., who told reporters he saw nothing amiss in Harper's financial reform campaigning. Jenkins, whose Canadian software company has operations in Germany, Britain and China, said Canada has sailed through the economic downturn and earned global respect in the process. "In the last five years, the reputation of Canada is awesome," said Jenkins. Amid the threat of a second global recession, the 54-country Commonwealth is facing its own crisis of relevancy. Leaders will use the three-day summit to debate demands for tougher, more enforceable rules regarding human rights, the rule of law and political freedoms among the Commonwealth countries. In his speech Thursday, Harper noted the common Commonwealth thread of Westminster-style governments and the liberty of the Magna Carta: "Principles, we believe, of universal application — yet sadly, in today's troubled world, still not of universal acceptance." He said it was his "strong hope" that the Commonwealth members would "reaffirm and reinvigorate" those principles this weekend — a line that drew the only sustained applause of Harper's 15-minute address. Sixteen Commonwealth realms that have the Queen as head of state will also agree here to rewrite the rules of royal succession to eliminate gender discrimination for future heirs to the throne. Following his speech to the Commonwealth business forum, Harper sat down for a meeting with Australian Prime Minister Julia Gillard. The main leaders' summit gets underway Friday morning and concludes Sunday.